Yup, that's right, Superman and Batman will be appearing together in the next Superman movie. 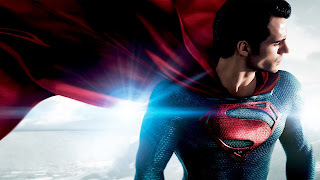 This film is set to come out in 2015, will be directed by Zack Snyder again, and will still star Henry Cavill as Superman, which is pretty rad since he did a good job in Man of Steel. Batman is as of yet uncast, and we don't really know anything about the storyline yet. The Flash movie has been set for 2016, which would be cool if it weren't coming out well before they've even announced a Wonder Woman movie. As DC Entertainment President Diane Nelson said, Wonder Woman is "tricky", so I wouldn't hold out hopes for a solo movie anytime soon. But at least the CW's Amazon is still a possibility, and there's no way they would dare making the Justice League movie in 2017 without the lady with the gauntlets. So, happy news and sad news. But good for Henry Cavill. He's done a good job with the character. And meh for Zack Snyder, who isn't the greatest director but did all right with Man of Steel. I'm unusually sympathetic to the "Wonder Woman is hard" argument, in that you can't make her quasi-space-opera like Thor - she's manifestly supernatural, and it's going to be hard to mesh that with aliens. Not that they shouldn't try anyway. Regarding World's Finest, they included a quote from the Dark Knight Returns. Which I really hope doesn't mean they're going to base the film around it in any way, as I find it one of the most intensely overrated comics I've ever seen. (I'm still fantasising about ways to have Faora return). I mean yeah, she is a hard character to figure, and I appreciate the honesty, but come on! Are we really saying that Green Lantern is an easier character to explain? He has the power of imagination, for crying out loud. And I desperately want Faora to come back because she is so stinking cool. But as a continuing villain or with a redemption arc? She's tough as nails - staying functional under the same sensory overload that initially dropped Zod, only going down from a missile to the face - and if there's one virtue she can be counted on to respect and strive for, it's sense of duty. I reckon she'd do surprisingly well as a Green Lantern. (And Superman's face would be priceless).